Robotic arms and other mechanisms have long been used to make or assemble furniture; but thus far, no one has ever created robots that are capable of becoming furniture. 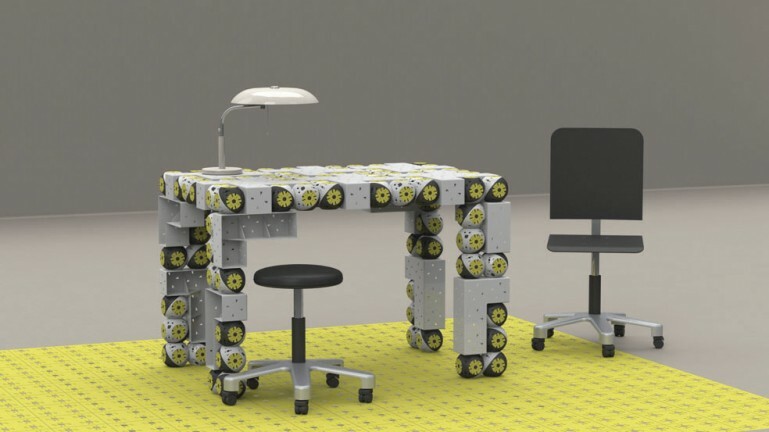 However, Swiss researchers are aiming to change that with Roombots, a brand of reconfigurable robotic modules that connect to each other to change shape and transform into different types of furniture, based on the needs and specifications of users. Created by the Biorobotics Laboratory (BioRob) at École polytechnique fédérale de Lausanne (EPFL), the self-assembling Roombots attach to each other via connectors which enables them to take on the desired shape. The team’s main goal is to create self-assembling interactive furniture that can be used in a variety of ways. They were designed primarily for the sake of helping the disabled or elderly by morphing to suit their needs. Like LEGO bricks, Roombots can be stacked upon each other to create various structures and/or combined with furniture and other objects, changing not only their shape, but also and functionality. For instance, a person lying down on a Roombot bed could slowly be moved into a seated position, or a table could scoot over to a corner or tilt itself to help a book slide into a person’s hands. The team has solved a number of significant milestones, such as the having the Roombots move freely, to bring all this multi-functionality closer. Each 22 cm-long module (which is made up of four half-spheres) has a wireless connection, a battery, and three motors that allow the module to pivot with three degrees of freedom. Each modules also has retractable “claws” that are used to attach to other pieces to form larger structures. With a series of rotations and connections, the modules can change shape and become any of a variety of objects. A special surface with holes adapted to the Roombots’ mechanical claws can also allow the modules to anchor to a wall or floor. We can ‘augment’ existing furniture by placing compatible connectors on it and attaching Roombots modules to allow it to move around the house. The range of applications for these kind of robotics is virtually infinite. For example, as seen in the video below, a series of Roombots as feet on a table that not only let it move around the room and come to the owner, but adjust its height as well. Auke Ijspeert, head of the Biorob, envisions that this type of customization could be used for physically challenged people who could greatly benefit from furniture that adapts to their needs and movements. It could be very useful for disabled individuals to be able to ask objects to come closer to them, or to move out of the way. [They could also be used as] ‘Lego blocks’ [for makers to] find their own function and applications. Meanwhile, design students at ENSCI Les Ateliers in France have come up with several more ideas for uses of Roombots, such as flower pots that can move from window to window around a building and modular lighting components and sound systems. 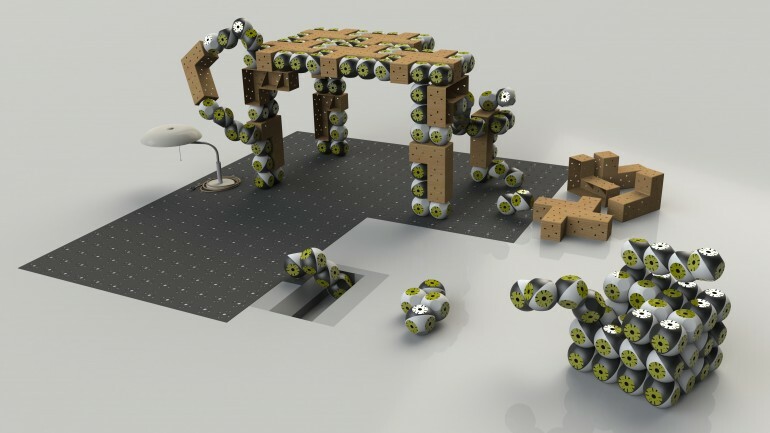 Similar to the MIT’s more complex self-assembling M-Blocks – which are programmable cube robots with no external moving parts – Roombots represent a step in the direction of self-assembling robots that are capable of taking on just about any task. For instance, imagine a series of small robotic modules that could be used for tasks like repairing bridges or buildings during emergencies. Simply release them from their container and feed them the instructions, and they assemble to prop up an earthquake-stricken structure or a fallen bridge. At the same time, it is a step in the direction of smart matter and nanotechnology, a futuristic vision that sees the very building blocks of everyday objects as programmable, reconfiguring materials that can shape or properties as needed. Another Five Star Review for Papa Zulu! Now we know which robots will hold us down when they rise up to take back what’s theirs.